On May 17th 2015 Mr. Günther Ingwersen from Nordfriesland and Mr. Winfried Langner from Lauenförde in Germany doubled up to drive to Nordkapp. They are driving their individual tractor – pulling a caravan each – thousands of kilometers to the far north of Europe. We met Günther 380 km south of the famous plateau. They have experience the magnificent spring throughout Norway. It is already summer in the south and the further they have bumped-the-bumped north, trees have turned green and farmers started to work the fields. Along the way they have been acquainted with several dairy farmers. Near Tromsø they also met some reindeer herders. I have been invited by a Saami family to enjoy a week with the reindeers in the autumn, says Günther. The people we meet along the Arctic Fjord Road have been most hospitable. At 20 km/h they are on average driving 100 km every day. Depending if they have to climb over mountains, the distance covered can be as short as 80 km. They haven’t had any major problems with the tractors along the way. We hope to finish in Germany in August as scheduled, Günther says. We will drive through Sweden on our way back home. We’ve been lucky so far, the only problem we’ve had is that the tractors need extra ignition fuel when we start up. 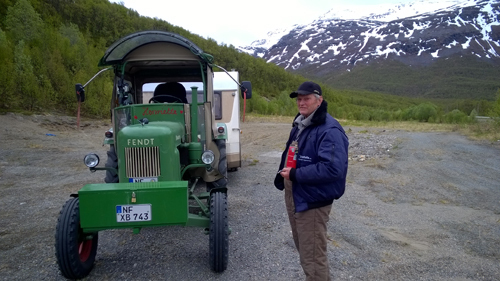 Günther’s 17 Horsepower Fendt from 1958 doesn’t like the cool Northern Norwegian summer. Five degrees is almost too cold for his “Henriette”. According to their plan they will be at North Cape on June 22nd. 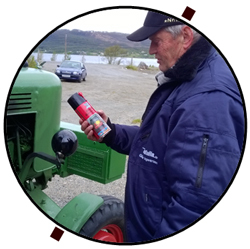 In Alta, they will be followed by a German TV-station, Norddeutscher Rundfunk the last few days – on tractor – to Nordkapp. Winfried has just left the parking spot with his “Robert”.